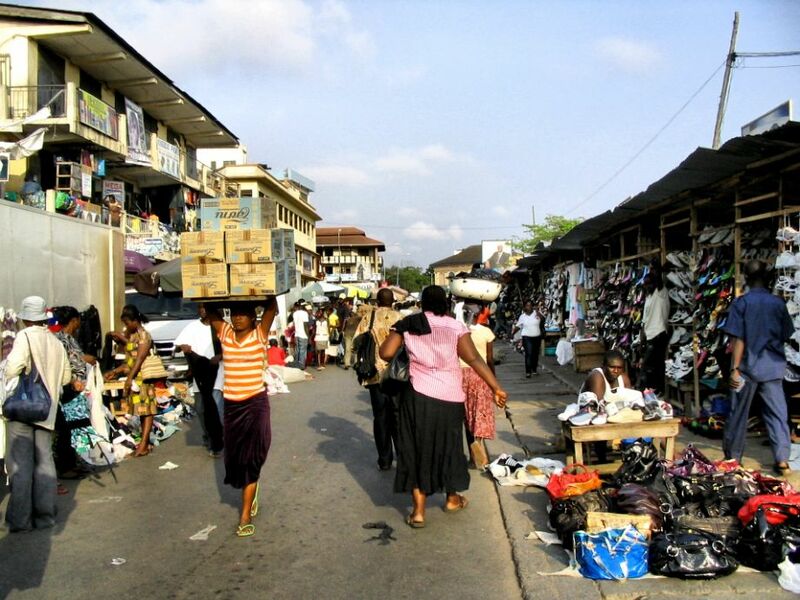 As the capital of a country where 43 percent of the urban population lives in slums , and 90 percent of non-agricultural employment is informal, Accra epitomizes the informal city. From public transport to domestic labor to fresh produce, the vast majority of goods and services in this city of 2.3 million are procured informally. Informality is so pervasive, in fact, that it’s not unusual to see the homes of millionaires standing adjacent to unfinished informal settlements, or slums occupying some of the most desirable real estate in the city. Nicknames and imagery like this reinforce the stigma against Accra’s informal settlements. Indeed, the government has repeatedly tried to evict slum dwellers en masse. But in general, residents of Accra’s informal settlements face less social discrimination than they do in cities like Nairobi and Mumbai, and living in a slum tends not to define one’s status in urban society. What’s more, inhabitants of Accra’s settlements have organized to fight off eviction efforts, and incremental improvements — often achieved through collaboration between locals and grassroots coalitions — are helping to legitimize the slums in the eyes of officials. In the Amui Djor slum, public toilets have been installed with support from the African Development Bank, and some residents have legally acquired low-income housing. In Sabon Zongo, community members formed a local police force. Efforts like these are contributing to stronger links between poor communities and government officials, and are laying the groundwork for Accra’s informal settlements to develop their full potential. From rampant inequality to unifying prosperity, a summary of the futures scenarios created for Accra at the Informal City Dialogues workshops. “Can we eat art?” the cynics ask. Perhaps not, but advocates for public art in Ghana say it can change the city for the better, especially for disenfranchised residents. Brewed cauldron by cauldron in the neighborhoods of Accra, traditional beers are attracting the attention of global distributors, turning a local ritual into big business.